Lots of bones to see in this underground ossuary, home of millions of permanent Parisians. As you enter Les Catacombes de Paris, having walked down 130 steps below street level, you're greeted with the cheery message, "Arrête: C'est ici l'Empire de la Mort," which means "Stop: This is the Empire of Death." Indeed, the catacombs are estimated to hold the remains of 6 to 7 million Parisians. That's a lot of bones! Since Gallo-Roman times there were limestone and gypsum quarries in this area, and the mining activity continued until the early 1800s. But in the late 1700s, concern was raised about the Cemetery of the Innocents, near St-Eustache Church and Les Halles. The cemetery had been in use for about ten centuries, and it was causing health problems for people in the area. The decision was made to move the remains to the underground quarries, after the quarries were consecrated. Transfer of the remains began on April 7, 1786. It took two years to move all of the remains, always at night and in a ceremony lead by priests. After those initial deposits, additional remains from other Paris cemeteries were transferred to the catacombs, until 1814. During the Revolution, some people went directly from te guillotine to the catacombs, including Robespierre and Danton. Called "catacombs" (spelled catacombes in French) based on an ancient Roman cemetery, this large ossuary is quite an amazing place to visit. Be prepared to go down stairs (130 down, 83 back up), walk about 2 kilometers through the maze of paths, and emerge into the light of day several blocks from where you entered. You might want to go on a hot day, as the temperature is about 57F (14C). The visit takes about 45 minutes. It's an interesting visit, if a bit macabre. And certainly unusual! Since 2002 the Catacombs have been considered part of the Carnavalet Museum. Renovations in 2008 opened some galleries that had not previously been accessible. Click here to order your discounted skip-the-line tickets via Ticketbar. Above, Friends forever in the Catacombs. Below, Sculpture in the Catacombs. 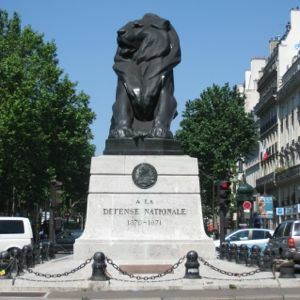 Above, the Lion of Belfort at the Place Denfert-Rochereau, near the entrance to the Catacombs.